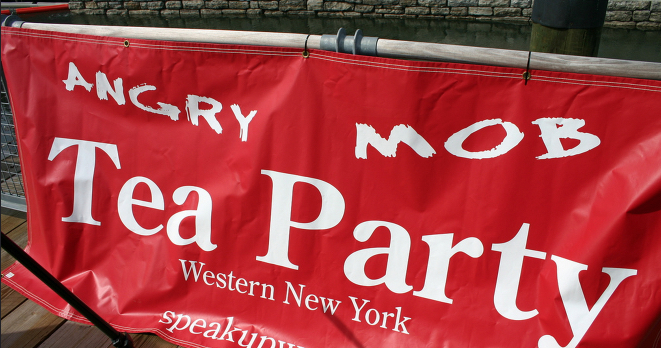 The Buffalo Tea Party on "Race"
In the wake of the vicious, racially motivated mass shooting in Charleston, South Carolina, we have seen quite a spectacle—even longtime conservative supporters of the treasonous Confederate Flag have denounced it. Only the far fringes of the racialist right-wing movement have made excuses for what the shooter did, and why he did it. Have you heard people accuse the shooter of being a “leftist”? White supremacy is an ultra-right-wing mindset because it takes something healthy, like patriotism or nationalism, and contorts it into hatred—often genocidal or nihilist. Karl Marx and Vladimir Lenin were communists, but they weren’t nationalists. On the contrary, their ultra-left-wing ideology called for an international revolution of the proletariat in order to bring about what they perceived to be a just economic order. By contrast, fascists such as Francisco Franco, Benito Mussolini, and Adolf Hitler took some of the bits of Marxism—that the rights of the individual must be subsumed by the needs of the collective (in Marx’s view, that collective had to do with class—in fascism, it was the “nation” or the “fatherland” or the “volk”). Fascism was a corporatist system that also incorporated some form of ultra-nationalist xenophobia and hatred—national supremacy. Hitler’s Naziism was the purest and most evil distillation of that. On the political spectrum, Naziism and fascism are ultra-right-wing, while communism is ultra-left-wing. After all, the fascists did to capitalism what they did to nationalism, and contorted it into something evil. Their only common threads were violence, dictatorship, and totalitarianism. Therefore, when we are discussing ultra-nationalist white supremacists here in the US, not only do the true believers like this kid who shot up the Charleston church self-identify as hard right, but that’s just where it sits on the spectrum. Ultimately, ultra-nationalist, white supremacist, nativist thought is a perversion of conservatism itself. They take the notion of maintaining the status quo and distort it into spreading hatred of some “other”—usually a historically oppressed or powerless minority that can easily be demonized. In Germany, they perverted their nationalism into a virulent and genocidal hatred of Jews, Roma, Slavs, etc. In Serbia a hatred of Croats, and vice-versa. In Russia, a hatred of the West. I’m not suggesting that the shooter was a Republican—just that he was a neo-Confederate ultra-right-wing genocidal monster. No reasonable person on the left wants the Confederate flag banned because you can’t ban it—it’s political speech. It would be stupid to try, as the 1st Amendment protects the rights of people to be neo-Confederate racists and fly that flag. Pointing out that someone made up Clinton/Gore badges with the battle flag on it back in 1992? We don’t know that it was sanctioned by the campaign, but if people are pointing out that the Clinton’s tolerance of that flag is different now than it was 30 years ago. That’s great! We should encourage people to assess the facts and alter their opinions accordingly. I’ll note that Governor Nikki Haley and Senator Lindsey Graham supported that flag flying on State grounds two weeks ago, and have recently changed their minds. Good for them. I’ll note that, as far as I’m concerned, anyone who voices support for that flag or its continued flight over any state property anywhere—and that includes several state flags of Southern states—is voicing support for slavery, sedition, treason, and white supremacy. You can shout ”heritage” all you want, but the heritage that flag represents is one of genocidal racism. So it should come as a shock that a local leader of the tea party—a supporter and lackey of Carl Paladino and a vicious, unprincipled liar—affirms some of the hatred that the Charleston mass-murderer Dylann Roof espoused. Quoting a rather insightful comment from Dylann Storm Roof, the extremely disturbed young man who killed church members in Charleston last week, he said “Black people are racially aware almost from birth, but White people on average don’t think about race in their daily lives.” He apparently tragically felt that needed to change, presumably in response to the violent race riots of late and the astonishing calls for violence against all Whites. I am personally very disturbed by the demand for a black superintendent. Imagine the outrage if some were to insist upon only a white superintendent. Apparently, the reasoning being “No one can understand the needs of our children like a black person can.” What, black children are different than white children? How so? Are they less capable? Not as intelligent? Does poverty affect their ability to learn? I can tell you from experience, with proper structure and support, it doesn’t. We believe the answer is NO, children do not have special needs based on the color of their skin, and children in Buffalo Public Schools do not belong to the black community alone. We ALL care deeply about raising the level of achievement and providing a better future for ALL children stuck in failing schools. To think otherwise is not logical. So, within the context of some members of the Buffalo schools community preferring an African-American Buffalo schools superintendent, a Grand Island interloper wants the school board to know that racist mass murderer Dylann Roof made an “insightful” observation in his own semi-literate “Mein Kampf”. So it’s not a question of lack of capability, but it’s untrue to suggest that poor inner-city minority kids are coming from the same environment as white kids from well-to-do homes. The schools aren’t necessarily failing because of the teachers or the curriculum or the superintendent—you have to attack systemic racism and the plague of poverty. No. Nothing about “Dylann Storm Roof” (and I question why the author used his full name here) is “insightful”. He was a homicidal maniac, and a neo-Confederate white supremacist, at that. In his mind, he was fighting for that racial collective of supposedly oppressed white folks, and used his words about racial awareness in an effort to spark a race war. To the extent that “black people are racially aware almost from birth”, that’s because being black in America is different from being white in America. The buzzword nowadays is “white privilege”, and it’s simply outrageous for some middle-class white woman from a tony suburb to come to Buffalo to lecture black people on their behavior and mentality. What the author is doing is not only excusing Roof’s actions, but endorsing his thoughts and words. She agrees with his motive—to her, it makes sense what Roof does because of “race riots”, presumably the anti-police-brutality demonstrations in Ferguson and Baltimore, and she even manufactures some sort of “calls for violence against all Whites”. I’m not saying some irresponsible protesters didn’t say such things, but that sort of inciteful language is no more outrageous than, for instance, a positive endorsement of the race hate manifesto of a mass murderer. This is like your old German uncle reminding you that Hitler fixed the economy and saved Germany. PLEASE stop telling our children from the time they are young that they are going to be treated differently simply because of their skin color. PLEASE stop focusing on skin color and start focusing on the need to achieve. Continuing this multi-generational failure is simply not an option anymore. A black child in Buffalo’s inner city doesn’t need to be told that he’ll be treated differently because of his race. As a black person in America, she’ll live it almost every day. She’ll be faced with signs of white supremacy and racism every day—whether it’s overt or closeted; shouted with a Hitlergruß, or spat in whispers. Whether it’s being racially profiled as a shoplifter in a store, pulled over while driving prudently through Kenmore, or listening to the misguided and tone-deaf condescending speeches from white suburban tea party loons, a black person’s racial identity and self-awareness isn’t something that he has some responsibility to tone down; it’s not a disease, but a symptom of a wider, more pervasive disease. The disease is white supremacy and racism, and no approving recitation of a mass murderer’s Buffalo News comment posing as a “manifesto” is “insightful” enough to quote, or to change that. Quoting approvingly from a murderer’s regurgitation of a white nationalist hate group’s ideology isn’t the way forward for poor black kids in failing schools.